Abrasive sheets, sandpaper, aluminum oxide abrasive sheets, silicon carbide abrasive sheets. Sandpaper sheets listed below all have a paper backing. Cloth sandpaper sheets are available, but not listed here. Please contact us for item numbers and pricing of 9" x 11" aluminum oxide cloth sheets. 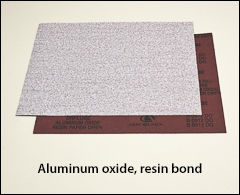 Aluminum oxide, glue bond, 9" x 11"
Cabinet and finishing paper sheets. Open coat to prevent loading. For dry sanding of paint, metal, and wood. Full size 9" x 11" sheets. Sold by the pack. 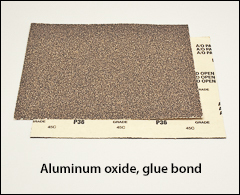 WARNING: Proposition 65 Label for a/o glue bond sheets . Aluminum oxide, resin bond, 9" x 11"
Premium aluminum oxide grain with long lasting resin bond. Open coat. Full size 9" x 11" sheets. Sold by the pack, 100/pack except 80 grit is 50/pack. WARNING: Proposition 65 Label for a/o resin bond sheets . Silicon carbide abrasive on stearated paper sheets with a special open coating to resist loading. Sold by the pack, 100/pack except 80 grit is 50/pack. WARNING: Proposition 65 Label for silicon carbide sheets . Silicon carbide abrasive on a waterproof paper backing. Resin bond. Can be used wet or dry. Full size 9" x 11" sheets. Sold by the pack, 50/pack. WARNING: Proposition 65 Label for silicon carbide sheets .